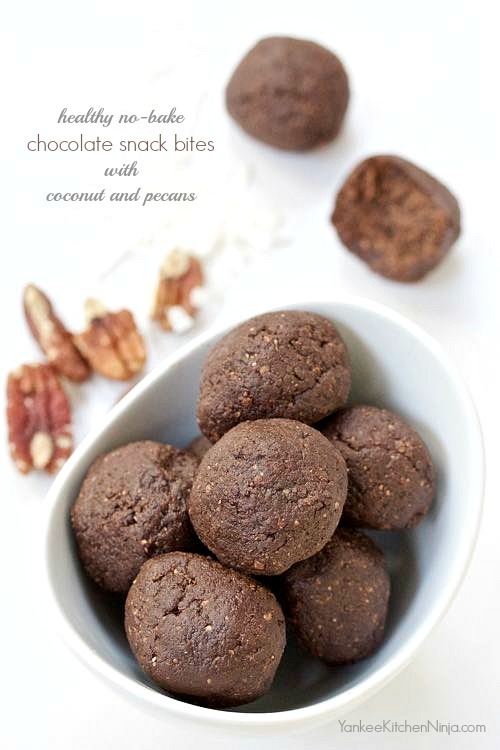 You're only four ingredients, five minutes and a food processor away from these healthy nutty chocolate coconut snack bites. With Halloween just around the corner and frightened by stories from of trick-or-treaters arriving by the busload in our new neighborhood, I have a cabinet full of giant bags of snack-sized candy that are screaming out my name. I can hear them in my sleep: "Eat meeeeeeeeee. I'm yummmmmmmmy. I'm sweeeeeeeeeet." Little devils! So what's a Ninj with little willpower to do? Make a healthy sweet snack to stop the voices, that's what. 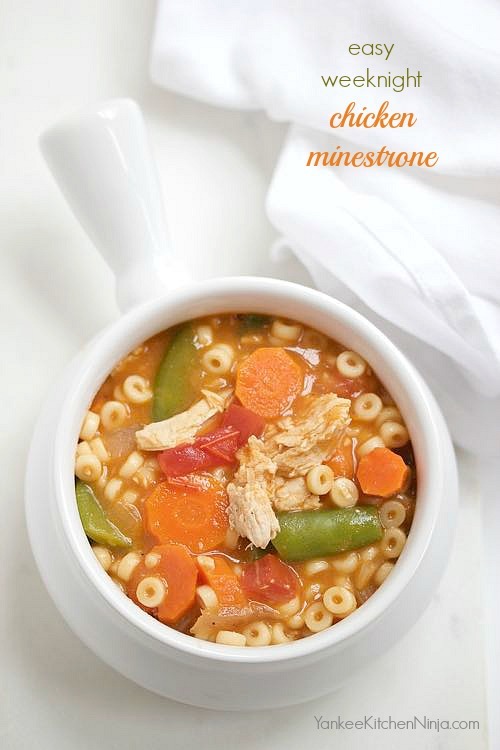 Get a warm, hearty dinner on the table in less than 30 minutes with this healthy and easy weeknight chicken minestrone soup. It's October and the weather is starting to get cooler. So of course I can't stop making soup and chili. And basically anything I can cram into the slow cooker. Of course, any soup that I'm making now has to be easy enough for a busy weeknight meal. This one fits the bill, as it takes less than a half hour, including prep, to pull it together. And did I mention that there will be enough left over for tomorrow's lunch bag? Winning. A healthy, easy, breakfast muffin, low in sugar in loaded with good-for-you apples and whole grain oats -- plus some seasonal pumpkin. Now is the time of year when I highlight a few pumpkiny things on the blog. Because it's actually October now, the time when pumpkins are in season and seasonally appropriate. Although you, like I, are likely suffering from a bad case of PSO: Pumpkin Spice Overload, which has reached epidemic proportions this year. I've gotten a bit of a reputation among my friends and readers over the years for being adamant with my No Pumpkin Until October rule. Every pumpkin-spice-hating meme has made its way on to my Facebook page, courtesy of Ninj fans. Don't get me wrong. I don't hate pumpkin. I'm just a firm believer in keeping my life and eating habits seasonal. And letting apples, one of the world's most perfect food, have their time in the sun, which is the entire month of September, in my book. It's the month for indulging in apple butter, apple pie oatmeal, apple bread pudding and apple sauce -- just for starters. 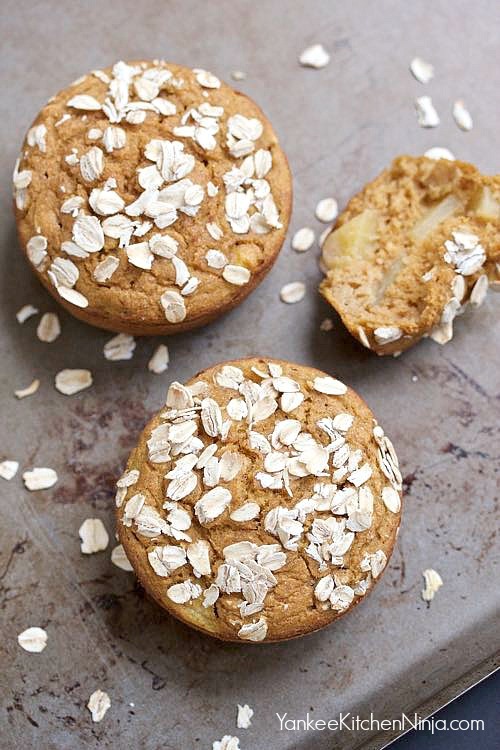 But now that it's early October, it's time for apples and pumpkins to join forces, which they do so quite deliciously in these healthy apple pumpkin breakfast muffins.